Historical information about the I’Anson surname. The first recorded spelling of the family name is shown to be that of James I’anson, given as being a sea captain. This is dated 1509, in the records of Hawkeswell, in Yorkshire, during the reign of King Henry V111th,1509 – 1547.© Copyright: Name Orgin Research www.surnamedb.com 1980 – 2010. Message from Julia September 2017. Peter Harold I’Anson Married Julia Pauline Baier, from Laverton, 26th August 1972 We emigrated to New Zealand the following week. We divorced a few years later. I believe that he remarried and continued to live in nz. My great aunt was Hannah Pickles and we lived at the laurels. Message from Linda Duncan. 27 May 2014.: My aunty – Brenda – was married to Alan I’Anson, my uncle died in c1993 of cancer, they had no children. Brenda and Alan were the popular landlords of The Wellington Inn in Darley for many years until the Tetley brewery sold it, from there they moved to Birstwith, then to Hampsthwaite where they were living at the time my uncle died – my aunt, now 80 lives in Harrogate. Message from Bette I’Anson March 29 2015. I am married to Hector, and I was wondering if you know that there is a plaque in Leyburn just passed Serendipity and outside the Undertakers, depicting the birthplace of Frances I’Anson. ………. The plaque in Leyburn. ……. Frances I’Anson. The following details are of the I’Anson families living around the Grewelthorpe area. Information taken from Census returns, Parish & School records and Memorial Inscriptions M.I. ALAN I’ANSON. Born 7.12.1928. Died C1993. Son of Frederick Heslington & Alice. Started Grewelthorpe school 9.4.1934 left to go to Pateley Bridge. 1939. Married Brenda see letter above. AMY I’ANSON. Born c 1905 Masham. Dau of Chrisopher [Ag. Merchant] & Mary Ellen. ANN I’ANSON [nee ?]. Born C.1836 Thornton Watlass. Wife of Christopher the Plumber. ANN E. I’ANSON. Born C.1869 Masham. Dau of Christopher the Plumber & Ann. ANNIE I’ANSON. Born C.1879 Fearby. dau of Robert & Jane. ARTHUR JESSOP I’ANSON. Born 25 July 1893. Married to Lizzie [born 1895]. Sheep & Dairy farmer at Agra Farm Healey in 1939. BASIL I’ANSON. Born C 1909 Masham. Died Sept 1996. Son of Christopher & Mary Ellen Hardy. BASIL RICHARD I’ANSON. Born 6.3.1947 Masham. Son of Hugh & Jennie Richmond. Married in 1969 to ? Hawkins. BEATRICE I’ANSON. Died 1837. Spinster. Admin proved Masham peculiar 22.2.1837. Lived Hackfall House Grewelthorpe. CHRISTOPHER I’ANSON. Born C.1828 Middleton Tyas. Died 6.4. 1904. in Masham. Son of Robert & Ann Anderson. He was a Plumber in Masham in 1881. married to Ann Williamson. of Thornton Watlass. CHRISTOPHER I’ANSON. Born C.1872 Masham. Died Oct 1937. Son of Christopher The Plumber & Ann Williamson.. An Agricultural merchant in Masham. Married Mary Ellen Hardy. of East Witton. in 1899. In 1911 they had 7 children. CHRISTOPHER [Kit] I’ANSON. Born C1907 Masham. Died 1986 Masham. Son of Christopher & Mary Ellen Hardy. Married in 1935 to Edith Evelyn Raper. See Obit at end. CONSTANCE I’ANSON. Dau of Mr & Mrs B.M. I’Anson of Knaresborough. Married George Howard of Knaresborough at Holy Trinity Church, Knaresbro. on 22 April 1937. [Ref. Yorks Post newspaper] Attended by sister Jose I’Anson. CRISPIN I’ANSON. Born 24.11.1749 Thirsk. Died 13.11.1821 Ripon. Son of Francis & Ann Adamson. Married  Sarah Dixon. in 1771. Elizabeth Stevenson. in 1793 Ripon Cathedral. DORA I’ANSON [nee ?]. Born 1907. Buried 28.1.1978 Grewelthorpe. M.I. 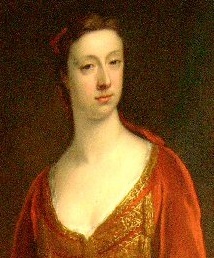 Wife of Frederick Henry. DOREEN ETHEL I’ANSON. Born 15.11.1916 .Bap 25.3.1917. Grewelthorpe. Dau of Frederick Heslington & Alice. Started at Grewelthorpe school 9.4.1923 Left 1930. DOROTHY I’ANSON. Born C1903 Masham. Dau of Christopher [Ag. Merchant] & Mary Ellen Hardy. DOROTHY IANSON. of Melmerby. Married John Coates. see Coates page. DOROTHY I’ANSON. 3rd Dau of C. I’Anson. of Waterloo House, Masham. A keen golfer and ambulance worker. Married T.W.Walker of Masham on 22 April 1935 in Masham. EDITH MARY I’ANSON. Born C 1902 Masham. Dau of Christopher [Ag. Merchant] & Mary Ellen Hardy. Married Bruce D.M. Chrystie in 1933. ELLEN MARY I’ANSON [NEE JOHNSON]. Born 27 April 1907. Living Leighton Cottages Healey in 1939. ETHEL MARY I’ANSON. Bap 17.6.1910. Dau of Frederick Heslington & Alice of Hutts Farm. FRANCES I’ANSON. Bap. 11.11 1766 Wensley. Died Dublin 30 Sept. 1795. Dau of William & Martha Hutchinson of Richmond. 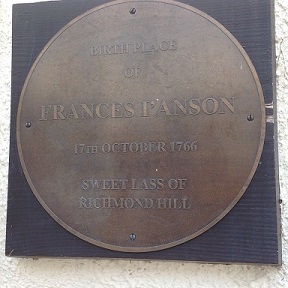 She was believed to be the inspiration for the song Sweet Lass of Richmond Hill. Married Leonard MacNally in 1787 in London. See picture at top of page. FRANCIS WILLIAM I’ANSON. Born C1861 Kirkby Malzeard. Shepherd at West Tanfield in 1901. Married to Mary Ann of Grewelthorpe. FRANCIS L. I’ANSON. Born 16 Feb. 1924. Son of John H. & Annie of Healey. FRANK I’ANSON. Born C.1895 Kirkby Malzeard. Son of Francis the Shepherd & Mary Ann. West Tanfield 1901. FREDERICK HESLINGTON I’ANSON. Died Feb 1958 Knaresborough. Farmed at Hutts Farm, Grewelthorpe for 30years.Married to Alice. Alice died 11 June 1948. Funeral service at St. James Church Grewelthorpe 14.6.48. FREDERICK HENRY I’ANSON. Born 1.9.1905. Buried 24.2.1973. Grewelthorpe M.I. Son of Frederick Heslington I’Anson & Alice. of Hutts Farm, Grewelthorpe. He started school at Grewelthorpe 1.4.1912 and left in 1919. Married Dora. GEORGE I’ANSON. Born C.1864. Son of Christopher the plumber & Ann. Butcher in Masham in 1881. GEORGE I’ANSON. Born 23 April 1900. Son of Mary of Healey. Lab at corporation waterworks in 1939. HANNAH I’ANSON [nee ?]. Born c 1833 Grt Heaton. Wife of Joseph the Gardener. In Fearby 1881. HAROLD I’ANSON. Born Dec 19th 1914 . Buried 5.10.1986 Grewelthorpe. M.I. Husband of Nellie. Lived West End Cottage, Grewelthorpe. In 1939 lived Laburnam Cottage. Grewelthorpe. A driver of a threshing machine. HARRY I’ANSON. Born 4 Oct.1919. Son of Arthur & Lizzie. of Agra Farm Healey . HUGH I’ANSON. Born 18.2.1911 Masham. Died 1990. Son of Christopher & Mary Ellen Hardy. Lived Waterloo House, Masham. Father of Basil Richard. Married in 1940 to Jennie Richmond. IDA I’ANSON. Born 5.7.1907. Bap 25.8.1907 Grewelthorpe. Dau of Frederick Heslington & Alice of Hutts Farm. Started at Grewelthorpe school 1.4.1914. Left 1921. JANE I’ANSON [nee ?]. Born C.1839 Naburn. Wife of Robert. In Fearby 1881. JANE I’ANSON. Born C.1872 Hampshire. Dau of Joseph & Hannah. In Fearby 1881. JANE E. I’ANSON. Born C, 1873 Fearby. Dau of Robert & Jane. JOHN I’ANSON. Born 18.10.1796 Ripon. Died 7.2.1856 Ripon. Son of Crispin & Elizabeth Stevenson. Married Eliza Braithwaite. in Feb 1827 Ripon Cathedral. JOHN THOMAS I’ANSON. Born C.1864 York. Nephew of William Binks. of West Tanfield. 1901. JOHN WILLIAMSON I’ANSON. Born C1864 Masham. In 1881 Grocer’s Apprentice for Henry Trotter. of Silver Street Masham. Married Mary Ann of Masham in C1891. JOHN H. I’ANSON. Born 20 Feb 1888. Married to Annie [born 1899]. Road man living Healey in 1939. JOHN H. I’ANSON jun. Born 12 April 1922. Son of John H & Annie of Healey. A horseman on farm. in 1939. JOSEPH I’ANSON. Born C 1830 Masham. Gardener in Fearby in 1881. Husband of Hannah. MAGGIE I’ANSON. Born C. 1885 Kirkby Malzeard. Dau of Frances [the Shepherd] & Mary Ann. MARIAN I’ANSON. Born 5 Oct. 1928. Living with the William Auton household at Fearby Cross in 1939. MARY I’ANSON. Dau of John of Kirkby Malzeard. Married Thomas Ellis. of Norton Conyers. on 16.12.1844 at Kirkby Malzeard. MARY ANN I’ANSON [nee ?]. Born C1855 Grewelthorpe. Wife of Frances William the Shepherd. Living West Tanfield 1901. MARY A. I’ANSON. Born 16 Mar. 1865. A widow living Healey with son George in 1939. MARY JANE I’ANSON. Born C. 1883 Kirkby Malzeard. Dau of Frances the shepherd and Mary Ann. MILDRED I’ANSON. Born 30 July 1911 Ripon. Married Christopher Edwin Verity. in 1934. [See Verity page]. NANCY I’ANSON. Born C1900 Masham. Dau of Christopher [Ag. Merchant] & Mary Ellen. PETER HAROLD I’ANSON. Bap 20.2.1949. Son of Harold. Married Julia Paulline Baier from Laverton in 1972. [see letter above]. Emigrated to New Zealand. ROBERT I’ANSON. Born 1792 Scruton. Died 1854 Middleton Tyas. Married in 1826 to Ann Anderson. ROBERT I’ANSON. Born C.1835 Swinton. Husband of Jane of Naburn. Farmer in Fearby 1881. ROBERT I’ANSON. Born C 1868 Hampshire. Son of Joseph & Hannah in Fearby 1881.ROBERT I’ANSON. Born C.1868 Masham. Son of Christopher the Plumber & Ann. ROBERT NORMAN I’ANSON. Born 1894. Son of John I’Anson & Mary Ann. Living Fearby in 1911. ROSAMUND I’ANSON. Born C.1875 Masham. Dau of Christopher the Plumber & Ann. SARAH I’ANSON. Born 20 March 1862. Retired widow living Healey in 1939. VERA FRANCES I’ANSON. Born 22.8.1918. Bap. 3.11.1918 Grewelthorpe. Dau of Frederick Heslington & Alice. Started Grewelthorpe school 1.4.1925. WILLIAM I’ANSON. Son of John of Azerley. Married on 25.5.1839 at Kirkby Malzeard. to Mary Carling. of Azerley dau of John. Witness to the wedding Robert Frankland. WILLIAM I’ANSON. Born 1892 Kirkby Malzeard. Son of Frances the Shepherd & Mary Ann. .A prominent figure in business & sporting circles Mr Christopher I’Anson 79 died at his home in Ripon last week. He was chairman & director of the family agricultural mill in Masham, I’Anson Bros.Mr I’Anson known to his many friends and associates as Kit, was a familiar figure among the farming community over a wide area, where he travelled to many farms and markets doing trade with the farmers in connection with the business which was started by his late Father in 1900. at premises in Church St in Masham. Since then the business has developed tremendously through the enterprise and enthusiasm of Kit I’Anson. and his 2 brothers. In 1959 the premises in Church St. were closed and a new mill was developed in Thorpe Rd. on the outskirts of Masham. which has a workforce of about 60 today. being one of the prominent animal feed mills in the country.During the 1939 -45 war the old water mill on the river at Masham was developed and was in service for a time as an additional source for the production of feed for farm stock.Right up to the time of his death, Mr I’Anson took an active interest in the family business. He was a keen sportsman and had been connected with Masham Golf club since being a lad. He also played cricket at Masham & Kirkby Malzeard, where he went to live after the war.Over many years he was a keen billiards and snooker player, and he played for the Ripon club after moving there to live.The respect in which Mr I’Anson was held was marked by the large attendance at the funeral on Friday last week. at St. Mary’s Church, Masham. Burial in the churchyard followed by a service.